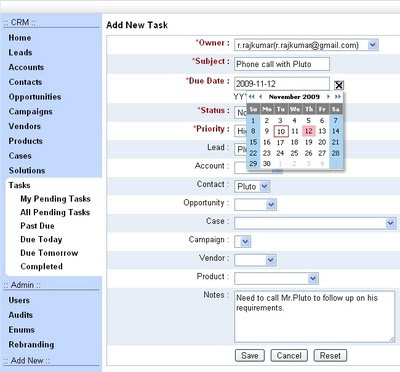 Google App Engine powered iFreeTools has added support for managing Tasks in its hosted CRM service. Now users can add Tasks and associate them to other CRM records which can be Lead, Account, Contact, Opportunity, Case, Campaign, Vendor and Product. A set of pre-defined views have also been provided for the Tasks module.. Check out the new module and as always, keep sending in your feedback on the Free CRM for Google Apps.